“Allahu Akbar, Allahu Akbar,” Amina hears as she walks closer to the Masjid. 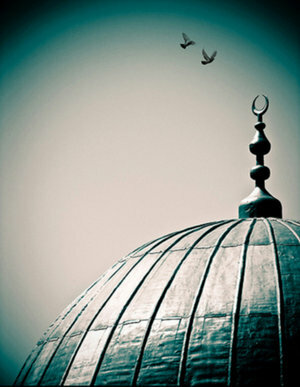 “Allahu Akbar, Allahu Akbar,” the athan begins to be called; the charming voice of the Muadhin is soothing and peaceful. As the athan is being pronounced Layla begins to repeat after the Muadhin, as she, Amina and Tariq go closer and closer to the Masjid. A white piece of paper labeled Sisters Entrance is plastered on the front door. As the athan concludes, Tariq walks towards the brother’s entrance. “Layla, I will meet you out here after Maghrib,” he says, trying hard to disregard Amina. Layla nods her head. As Layla and Amina make their way inside, a group of sisters memorizing the Quran have just concluded their weekly class. Layla says salam to them, and Amina stares at them. “Amina! We haven’t seen you for so long, how have you been?” says Maryam, one of Amina’s old Quran teachers. Maryam nods her head, and from behind her Sarah returns from making wudo’, drops of water dripping from her hand. Sarah look towards Amina, and walk towards her. She places her hand on Amina’s shoulder and smiles. “Can we talk?” Sarah asks. Amina agrees and follows Sarah to the shoe area. Amina’s heart skips a beat, thinking about all the possible statements Sarah could say to her. “I, I haven’t spoken to you in so long,” Sarah says. “Yeah, I know. I miss you.” Amina admits. Amina reaches over to hug Sarah, they embrace happily and tears of joy twinkle down Amina’s eyes. “Oh, I almost forgot, I need to give you something,” Sarah says with excitement, she pulls out an elegant card with floral designs on itand hands it over to Amina. “This is going to be a big shock to you, but I’m engaged,” Sarah says with thrill going down her spine. “What! To who? Congratulations!” Amina says with a look of thrill. Amina begins to have nostalgia of all those boys at school that tried to tempt Sarah. With their stares, and school-related questions just to be able to speak with her. But, she held firm, she did not allow herself to be subject to their plans. She would just ignore them; distance herself away from them and kept tawakul in Allah (SubahanuWa Ta’ala). Amina begins to remember the days she wished she could be like Sarah, righteous and God fearing. But Amina, along with her jilbab and dignity let it go for someone who at the end of the day doesn’t even matter any longer. As Amina opens her mouth to say something, the Iqamah begins to be called. “We’ll talk later,” Sarah says, grabbing Amina’s hand towards the congregation. As Amina stands while the Iqamah is being pronounced, she feels peace inside her heart, a feeling she had not been feeling for a long time. The spiritual void has begun to let go of her body, and once again she feels the urge to return to her Lord. Layla joins the line and stands next to Amina. As the Imam, begins to lead the prayer, Amina feels serenity to hear the sweet recitation of the book of guidance, she had once long ago, been memorizing. Her tears begin to pour out of her hazel eyes like a water fall, she holds her shirt near her nose, and takes a deep breath. When she goes into sujood, she begins to make duah in Arabic, “Oh Allah guide me, forgive me and bless me.” As she feels sincere and utmost concentration, the prayer ends. She takes a breath, and Layla pulls out a tissue and gives it to Amina. “Salam Mom, Yes I am at the Masjid don’t worry, sorry I forgot to tell you…. Oh you don’t have the car? OK I’ll try to catch a ride, Ok Salam.” Amina puts the phone in her phone and looks up to see Layla and Sarah talking. “Do you need a ride hun?” Layla asks. “Don’t worry about it, my mom’s here to pick us up, we can take you too,” Layla says. “Or you can come with me, Amina, I am car pooling with Maryam, she probably won't mind,” Sarah says. “That’s sounds perfect,” Amina nods. Amina embraces Layla, and thanks her for her kind hospitality. Sarah also meets Layla and tells her she’ll see her this weekend. As Layla exits the Masjid, she waves back at Amina and Sarah, while they stand at the Masjid doors. Tariq walks towards the car from the brother’s side, and looks slightly towards Amina’s direction from afar, he looks swayed and instantly turns his head, and gets into the van, as they drive away. “So, you still didn’t tell me who you’re getting married to. What’s his name?” Amina asks with curiosity. Amina’s heart stops a beat, her face starts to turn warm, but then she reminds herself, that whatever Allah decrees is for an infinite and definite wisdom and purpose. If the relationship did not begin on a halal note, how could it end in such a note? “One of his Quran tutors, Ahmed.” Sarah says smiling. Looking forward to reading more short stories from you, inshaAllah! MashaAllaaah! Amazed to read it! May Allah bless you dear! Very well written, hope to read more! Ameen! JazakiAllah Khair for your comment I appreciate it! omg masha'Allah that was beautiful. the ending i had to hold my breathe when sarah said tariq's name :O but masha'Allah beautiful!! LOL, Alawiya JazakiAllah Khair ukthi, so happy you got to read it and enjoyed it. Great lesson to learn from. Whatever ALLAH will , wil usUally be. Great lesson to learn from, whatever Allah wills, will surely be.